Zuzana Lizcová, Ph.D. is a lecturer at the Institute of International Studies, Charles University Prague and freelance journalist. She focuses on German speaking countries, their international influence and bilateral relations with the Czech Republic. 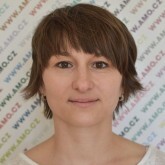 She is also a Czech coordinator of the Czech-German Young Professionals Program (CGYPP). In 2011 she finished her Ph.D. studies in the subject International Area Studies at the Faculty of Social Sciences, Charles University Prague with the thesis Cultural Relationships between Czech Socialist Republic and Germany in the 1960`s. In 2005 she accomplished her master studies in the subject German and Austrian Studies at the Faculty of Social Sciences, Charles University Prague. During her studies she spent one semester at the Humboldt University in Berlin (with the support of DAAD-scholarship). In 2007 she participated in the program Medien – Mittler zwischen den Völkern of the Robert-Bosch-Foundation and got a professional training at the German News Agency (dpa). In 2014 she was a participant of the Czech-German Young Professionals Program (CGYPP). In the years 2004 – 2013 she worked as an editor with focus on German speaking countries and Middle-East Europe for the Czech Press Agency (ČTK). Currently she writes as a freelancer for several Czech newspapers and magazines.